SAILKARMA.COM - Sailing News, Videos and Photos! : Local boys: Bring it on! (From for NZherald By Dana Johannsen) New Zealand's past, present and future yachting stars are among the top international names lining up in the Omega Auckland match racing regatta this week. With 10 of the biggest names in the world competing in the regatta, which begins on the Waitemata Harbour today, there are a number of juicy match-ups to contemplate. 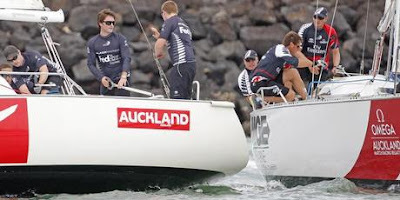 But it is the battle between the local heroes - former America's Cup sailor Chris Dickson, Emirates Team New Zealand skipper Dean Barker, and Kiwi sailing prodigy Adam Minoprio - that is shaping up as the most hotly anticipated. Dickson returns to the match-racing scene after a fairly quiet couple of years following a disappointing campaign with BMWOracle in the 2007 America's Cup. One of Dickson's first battles this week will be against young gun Minoprio, who he meets in today's second match. Minoprio may be one of the youngest in the field this week, but his position atop the world rankings means it is unlikely the other competitors will take it easy on him.